Florence is currently getting ready for an “event of historic magnitude” as it has been called by her mayor Dario Nardella (http://www.theflorentine.net/news/2016/09/medici-tapestries-come-home/). 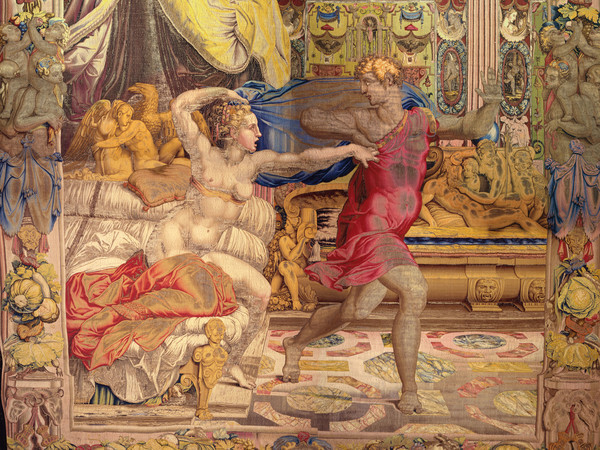 A group of high-renaissance tapestries depicting the Old Testament Story of Joseph (“Prince of Dreams”) and divided between the Florentine Soprintendenza and the Quirinale in Rome since the nineteenth century will be reunited on a permanent basis in Florence to be displayed in the very room (Sala de’ Dugento) for which they were made in the 1540s. 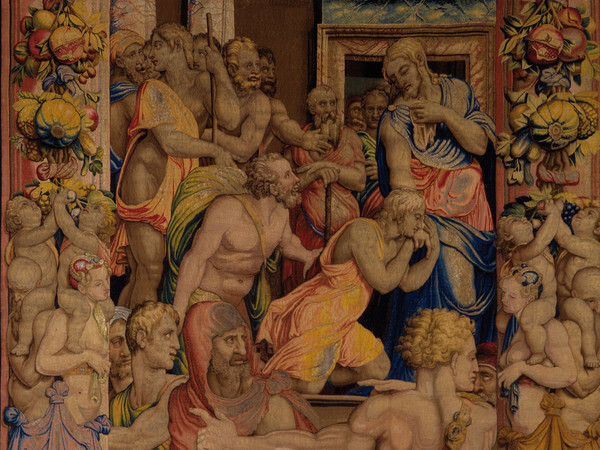 In 2015, they had already featured in an itinerant exhibition moving from Rome to Milan and finally coming to Florence (http://www.theflorentine.net/news/2015/09/a-rare-homecoming-for-medici-tapestries/). Duke Cosimo I de’ Medici (1519-1574) moved into the former Palazzo dei Priori in 1540 and started a lengthy renovation and redecoration campaign that would last well into the 1560s and turned the republican city hall into a ducal palace with state apartments, display rooms and halls of state (http://museicivicifiorentini.comune.fi.it/en/palazzovecchio/). One of the important innovation resulting from all this work was the creation of a new industry in Florence, a city that after all had long been famous for quality fabrics, in particular fine wool production. The young duke may have been influenced by the cultural heritage of his new wife, Eleonora of Toledo, whom he had wed in 1539. Spanish born, well connected and brought up in part in Spanish Naples, Eleonora brought her own expectations in luxurious court accommodation with her to Florence. Such expectations would have been inspired both by typically Spanish customs of interior decoration, indeed magnificent leather wall-hangings appear listed in the Medici inventories after her arrival in Florence, as well as by the splendid woven tapestries displayed at the Burgundian court. 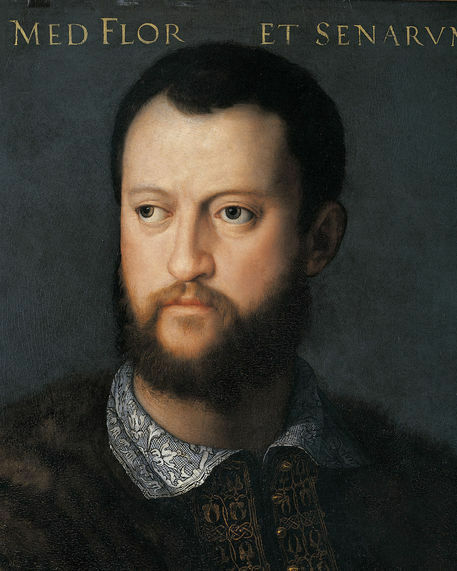 Cosimo I’s decision to follow such an example was probably motivated by the fact that Emperor Charles V Habsburg, after all born in Ghent and brought up in the Burgundian Netherlands before moving to Spain in 1517, was a major patron of tapestry manufacture in Brussels. Charles commissioned several series of such luxury items, commemorating particularly important events – for example the conquest of Tunis. The Florentine duke who depended on imperial support in no small measure may have found it advisable to follow Habsburg court culture. As we know, for instance from the research of Lucia Meoni, Thomas Campbell and Robert G. La France, Cosimo I founded his tapestry workshop in Florence in 1545 and invited two Flemish weavers, Jan Rost and Nicholas Karcher to work for the Medici-Toledo court. There, Rost and Karcher soon picked up numerous commissions after the designs mainly of Bronzino and Bachiacca. One set consisted of the 20 Joseph tapestries for the Hall of the 200 – where they are about to return – another was the Months for the duchess’s Golden Rooms on the palace’s third floor. The Florentine tapestries were usually marked with an inscription of “made in Florence” (fatto in Fiorenza) and bore the symbol of Rost and Karcher (a roast on a spit). The commission, possession and collection of this kind of costly luxury textiles alluded to the rank and status of the owner, not least since there was a tradition of using them as the appropriate backdrop in court settings or for particular political events from the fourteenth to the sixteenth century. For example, the meeting between Francis I and Henry VIII at the Field of the Cloth of Gold (Camp du Drap d’Or) in 1520 is probably better remembered for the fabrics that gave the encounter its name than by the diplomatic outcome. The prohibitive cost as well as the need for well-trained artisanal staff and ingenious court artists meant that this kind of product was reserved for the aristocracy. Newly ennobled ruling families such as the Medici used this medium to position themselves on Europe’s political and aristocratic stage. Where did the fabrics come from? A recent publication, Europe’s Rich Fabric. The Consumption, Commercialisation, and Production of Luxury Textiles in Italy, the Low Countries and Neighbouring Territories, edited by Bart Lambert and Katherine Anne Wilson (Farnham: Ashgate, 2016) looks in some detail at how luxury textiles connected different parts of Europe on an economic and political level by means of production, consumption and trade. In particular Italy, and there Florence, and the Burgundian territories play a major part in this volume as the condensed outcome of a series of encounters which repeatedly gave the contributors the possibility to discuss and ponder. The volume is one of a number of Ashgate publications dealing with clothing laws and the mercers’ trade from the Middle Ages to the seventeenth century, research that is all the more interesting for being very international and generally European in scope. Apart from that, Lambert’s and Wilson’s book is also very multidisciplinary, for its contribution look at textiles at court and in church, at financial interest and trade as well as at the production of silks and woollen cloths and its connection to and importance for the European labour market. Textiles made attractive gifts, they were shown to selected audiences and they accompanied a person’s life from birth over the marriage trousseau and by means of interior decoration all the way to the end. Luxury items or not, they were often rather expensive and of good quality and, therefore, valued commensurably. Their production gave work and an income to substantial and diverse groups of the European population. Even though these fabrics were made from fine wool, silk, gold and silver – the latter more sparingly used for it might tarnish – they were not labelled as luxury goods. Usually referred to as costly or large, they were listed mostly under clothing but also as furnishings in the household inventories depending on their use and the location of their display. The essays in the volume also look at groups of owners and audiences as well as at centres of production, trade and consumption – not necessarily all in the same place or even in the same country. Interestingly, Florence plays an important part in the production both for manufacture and as a financial hub with far-reaching connections to the North of Europe, Burgundy and England, through her merchants and banking houses. Florence was also an important export centre in stiff competition with other such Italian centers for example in Lucca or Venice. The raw materials were sometimes produced locally, sometimes traded internationally with the help of bankers and worked according to the requirements of the targeted markets across the Alpes. The quality was not always consistent and the merchants abroad sometimes complained bitterly at home that the colours were bad or that the gold thread was barely visible. While all the essays are gripping and show clearly how little has changed in the world of high-end business and high finance, perhaps the most delightful chapter is that by Laura Weigert about a set of choir tapestries for the monastery of Saint-Remi (69-87). It is also the one most richly illustrated with colour plates (5-13) depicting tapestry panels of the Life of Saint Remigius donated by Robert Lenoncourt, archbishop of Reims in 1531. Designed and woven in Flanders, these splendid wall hangings nonetheless attest to the international network of the artists and artisans involved, even though choir tapestries such as these could mostly be found in France and the Duchy of Burgundy from the fifteenth century onwards. Painted or woven saints’ lives attracted the veneration of and provided inspiration for the religious community in residence. Saint Remigius life, his many miracles and in particular the conversion and baptism of King Clovis lent itself rather well to a depiction in a medium adopted frequently in a courtly ambience. 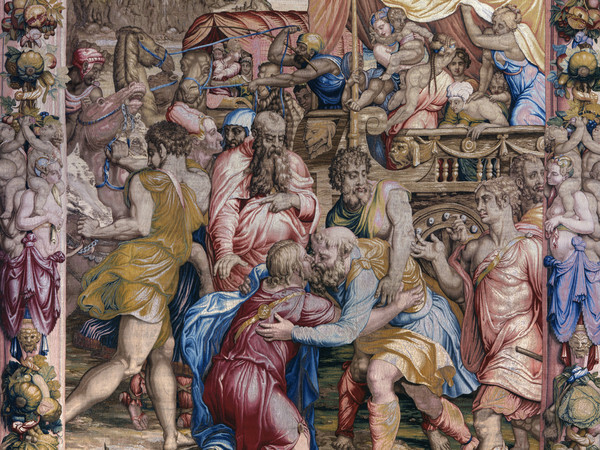 In the case of this specific set, which replaced an earlier one from 1419, the sheer size and expressiveness of each scene seems to connect the tapestries to an extant Saint Remi play and its human actors performing in it during city holidays. Thus, the display united inspiration from diverse media as well as the interests of city, monastery and archbishopric in one enduring performance.